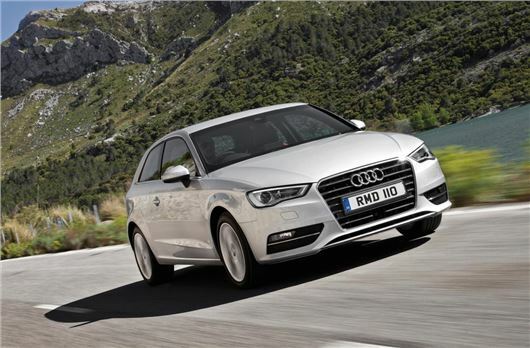 Changes to the Audi A3 range for the 2016 model year see diesel CO2 emissions drop to 89g/km for the new TDI Ultra, boosting its credentials with company car drivers. The new A3 and A3 Sportback 1.6 TDI Ultra models offer 83mpg potential with emissions of 89g/km, and form part of an expanded 2016 Model Year A3 line-up that also makes quattro all-wheel-drive available on more models. To create the A3 1.6 TDI ultra, the gear ratios have been modified, lowered sports suspension has been incorporated and special tyres have minimised rolling resistance. Whether in three-door or five-door Sportback form the new 110PS variant, equipped exclusively with six-speed manual transmission, is capable of covering up to 83.1mpg according to the combined cycle test, equating to CO2 output of just 89g/km. The three-door version needs 10.5 seconds to reach 62mph from rest, closely followed by the Sportback at 10.7 seconds, and both models top out at 124mph. For business users the benefits of even further reduced emissions are reflected in a drop in BIK band from 17 per cent to 16 per cent, contributing to an annual liability for a 40 per cent tax payer of £1,331.84, or just over £110 per month. These are set to reduce by three percentage points for the 2016/17 tax year as the Government removes the supplement on diesel company car tax. the TDI Ultra models are available as SE and SE Technik variants incorporating specific adjustments which help to maximise its potential, including 16-inch alloy wheels in specific designs, combined with low rolling resistance tyres, and both feature lowered sports suspension to minimise drag. SE specification includes air conditioning, the MMI radio with its slim, electrically folding screen, the Audi Music Interface, a Driver Information System, the Bluetooth mobile phone interface and a multi-function steering wheel. SE Technik models add SD card-based satellite navigation over SE version, and also gain rear acoustic parking sensors, cruise control and a colour screen for the Driver Information System. Drivers seeking to add increased all-weather performance can also now choose a 1.6 TDI quattro version of the A3 Saloon or the five-door A3 Sportback. The former combines the rapid-acting multi-plate clutch-based all-wheel-drive system with six-speed manual transmission and Sport specification, and the latter with either SE or Sport options. Sport specification adds features such as 17-inch alloy wheels, sports suspension, sports seats with Rallye cloth upholstery, dual-zone electronic climate control and the Audi drive select adaptive dynamics system. The most accessible quattro model is now the three-door A3 Sportback 1.6 TDI quattro, which can reach 62mph from rest in 11.2 seconds, continue to 120mph and return up to 60.1mpg according to the combined cycle test, corresponding to CO2 output of 127g/km (with 16-inch wheel). The 2.0-litre TDI 150PS engine which sits on the rung above the enhanced 1.6-litre unit in the TDI line-up is also newly available with quattro drive as part of the 2016 model year changes, joining the 2.0-litre TDI 184PS version in offering front-wheel-drive or all-wheel-drive options.